This is a medium shrub with unusal, showy red flowers that are highly attractive to hummingbirds. It is slow-growing and reaches around 3' high before spreading out to a width of nearly 6'. 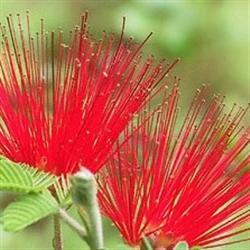 Its dark green leaves are like tight miniature ferns, overshadowed by red flowers that are reminiscent of a feather duster (hence the name, Fairy Duster). The seed pods are like mini-snow peas which explode when ripe. Native to sandy washes, flats, and hillsides in the Cape region of Baja California. They are evergreen; it is reported that they will lose their leaves if drought or cold stressed, and in their native habitat bloom after spring and fall rains.